Welcome to our foyer design ideas gallery. 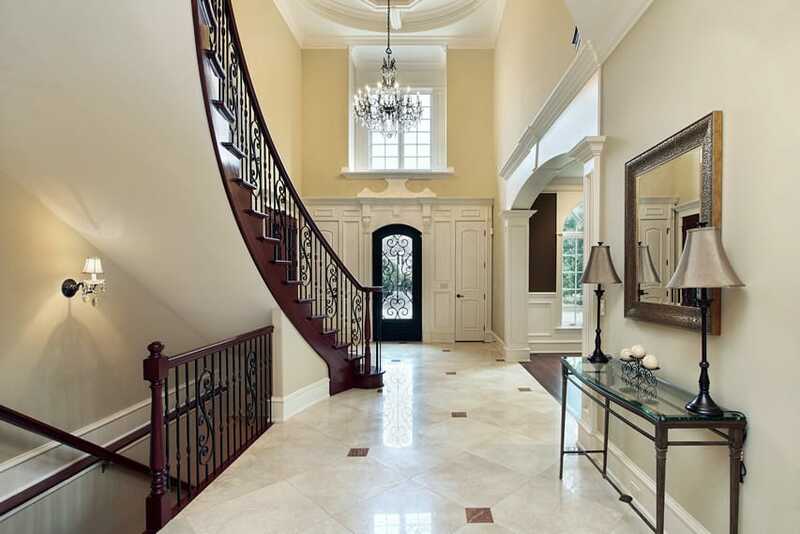 The foyer or entryway to your home is the first impression one gets when they enter your home. 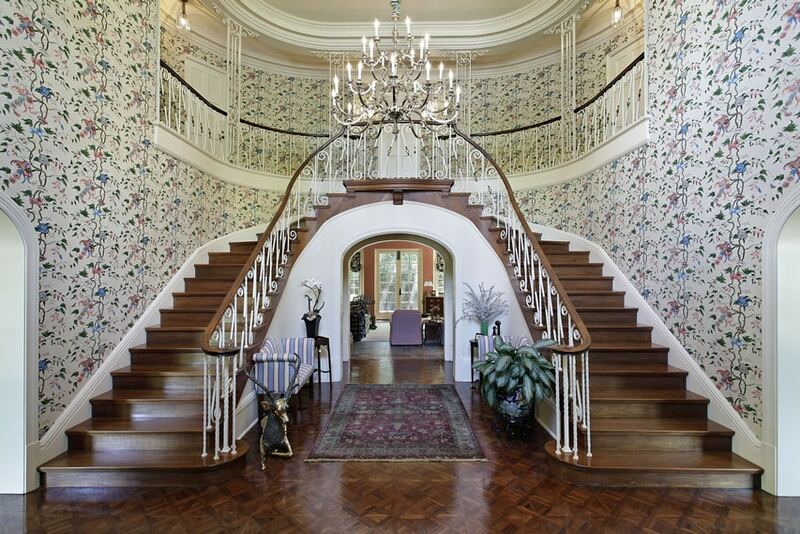 While the foyer may not be the most functional part of your house, it is one of the most visible. For this reason it’s important to add finishes, furniture, and decor to impress your guests as they arrive and create a warm environment for you and your family. In the first picture of this foyer collection shown above; upon entering the home you are greeted by an elegant curved staircase with a delicately design wrought iron railing, with solid wood handrails and solid polished wooden steps. Walls are finished with a textured wallpaper, creating a warm backdrop and one large round table from which a large vase holding decorative flowers stand to accessorize the space. Add some flair to your front door – Depending on your personal style your front door color can match with the interior of your home and make a great impression. To make it stand out, you can try painting it with a bold contrasting color. 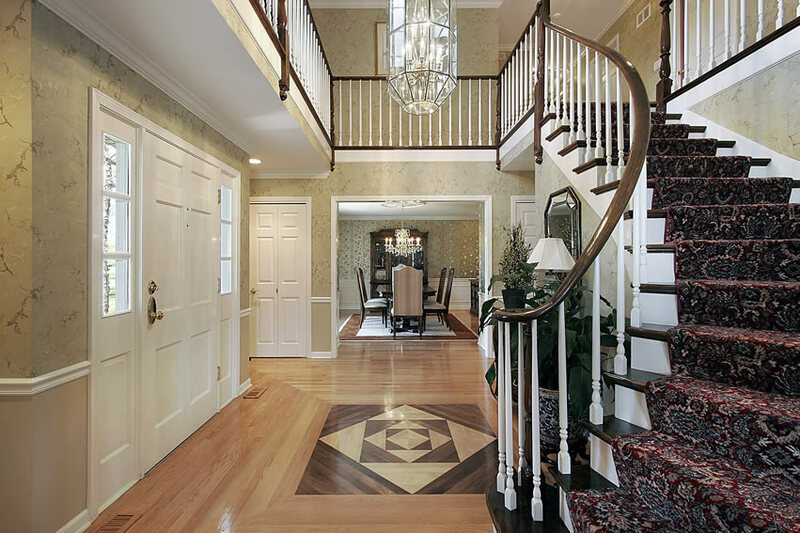 Define the entry space – Many homes have hallways, vestibules, or doorways to define the foyer area. However, if you don’t you may want to separate the entryway space by changing flooring types, add arches, placing design elements, area rugs, furniture or plants. Add storage options – You can borrow from the kitchen with storage solutions such as cubbies and decorative cabinet pieces to help keep shoes, keys, and other items out of sight while beautifying your room. Hooks can be used to hang jackets if no closet is available. Furniture pieces such as entry tables can be included to hold lamps, or fresh flowers to brighten things up. Space for sitting – Benches and chairs can be a great addition for quests while waiting in your entry. Try adding a rustic tray under a bench for wet shoes to keep them accessible and out of the way. Wall hangings, and mirrors – Adding wall hangings can bring some of your personal style in to the foyer. Adding mirrors can have a dramitic effect, emphasize the other wall and make a smaller space appear larger. Add your own decorating touches – Adding your own accent pieces can showcase your passions, or interests and create a warm feeling for you and your visitors. This is especially true if you are working with a small space. Focus on creating a welcoming entryway by adding a couple choice pieces that share who you are. Another tip for foyer design is to adapt to the seasons. Try adding season themed decor to your space to get visitors in the right mood. 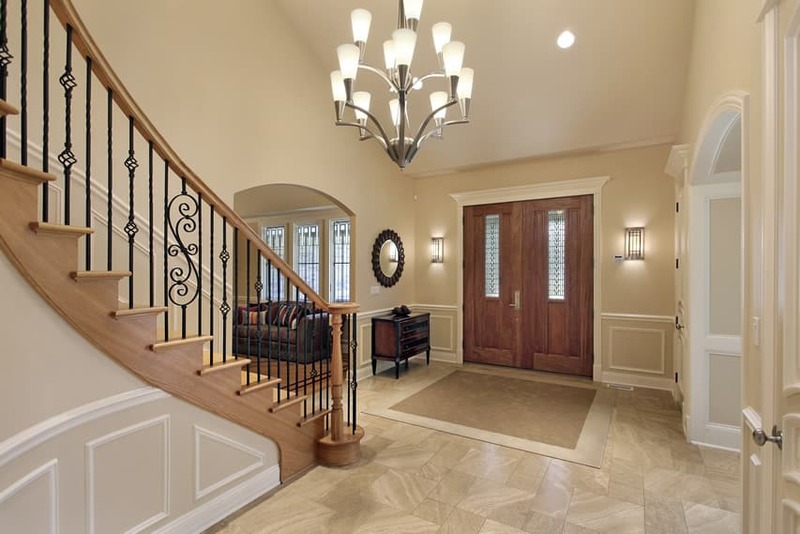 Include plenty of lighting – A well lit entryway is a must and there are many great choices to get the perfect look. From pendant lighting, to wall sconces or even a decorative chandelier, there are many ways to use lighting to add drama and style to your space. 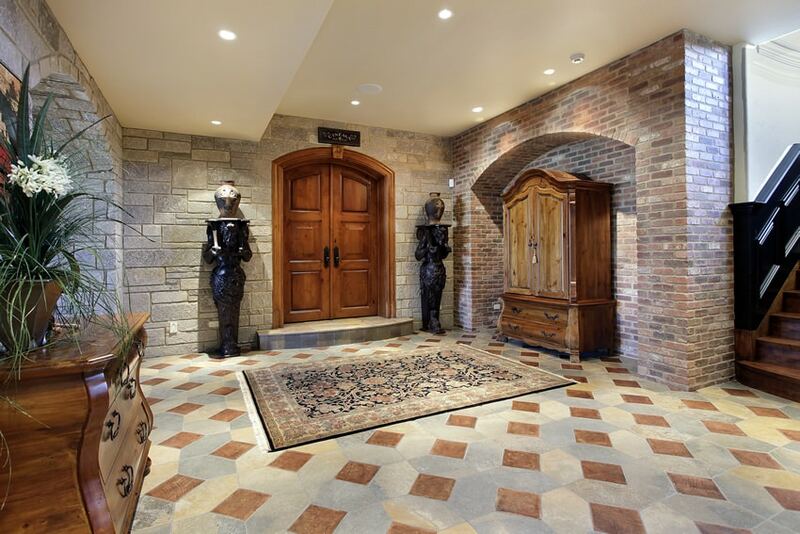 Spruce up the entry floor – Many home designers are opting for entryways made of natural looking stone for it’s timeless quality. Other popular choices inlcude hardwood, and porcelain tiles. 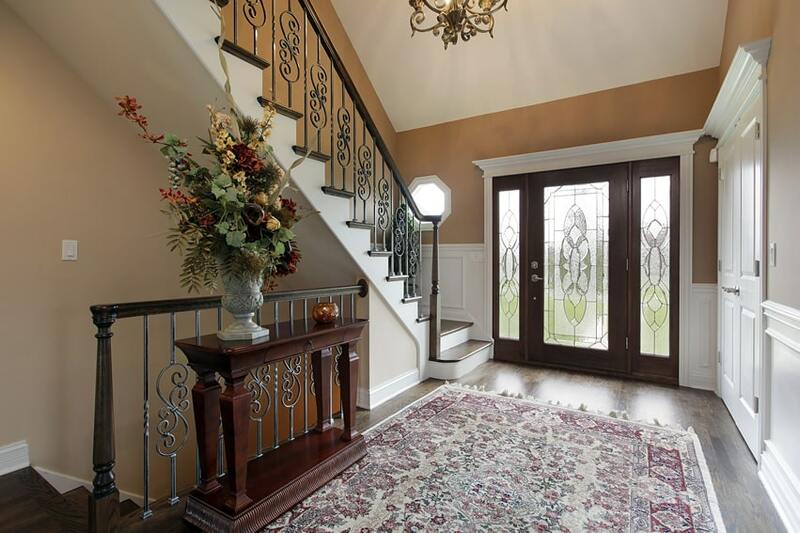 Since the foyer is a high traffic area it’s a good idea to add a carpet runner or mat to the entry to handle the wear. 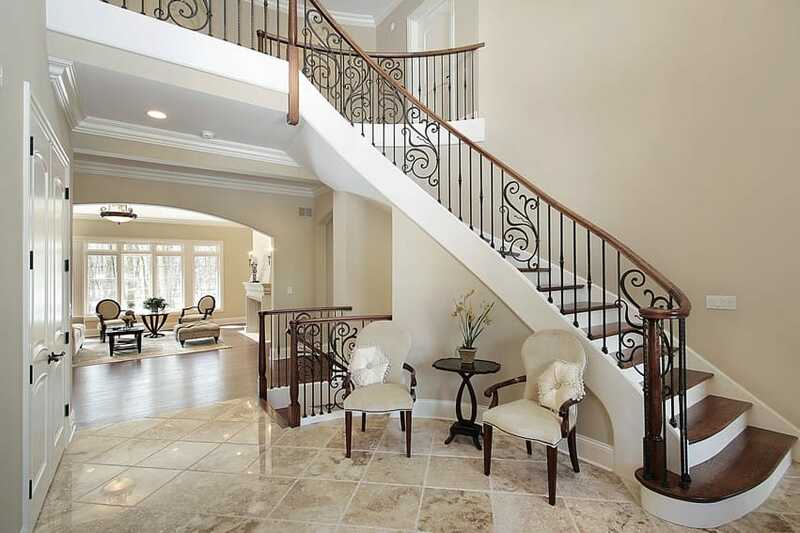 An elegant staircase awaits as you enter this home, with wrought iron stair railings and handrails and a crystal chandelier hanging above the high ceiling. There is a small console table just past the stairs made from wrought iron with a marble top decorated with classic lamps, candles and a silver-framed mirror which seems to blend into the light gray background. Dark wood plank and parquet flooring contrasts beautifully against the white and gray paneled walls and cream color furniture of the living room. 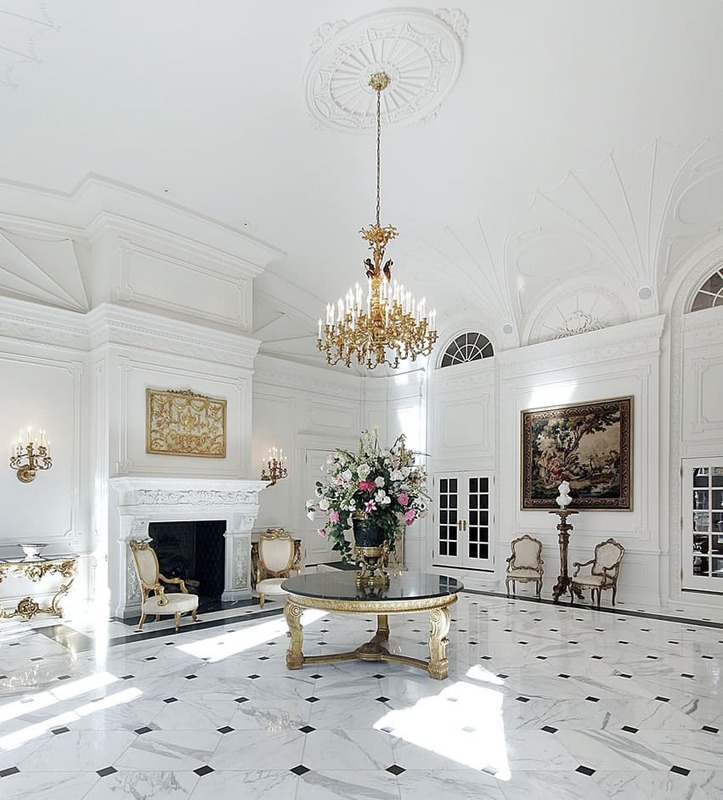 Unlike the previous examples, this foyer doesn’t have a staircase to welcome you but a large grand room with marble flooring and white paneled walls, furnished with a few gilded side chairs and a large round table with gilded legs and black stone top, decorated with a large vase with an elegant flower arrangement worthy of this Rococco-inspired space. 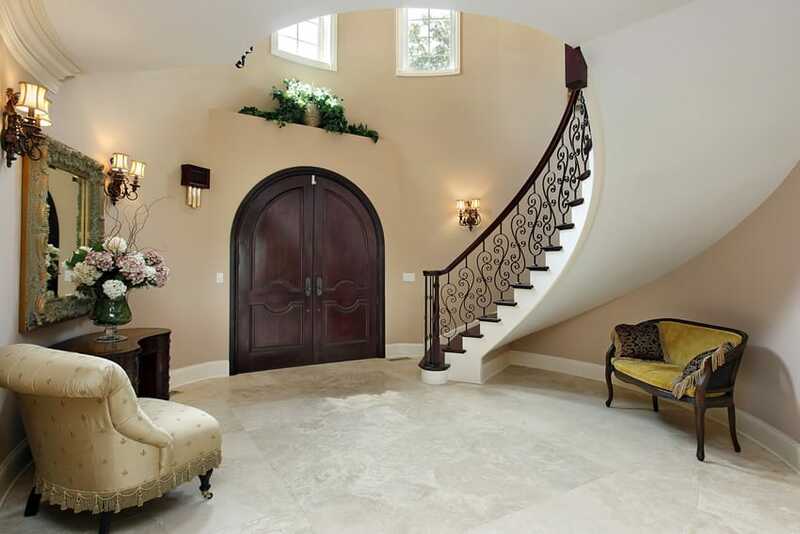 This is a simple foyer with large cut natural stone floors and simple beige-painted walls. It has a large curved staircase with wrought iron railings and wooden handrails directly beside the opening of the large arched doors. It is simply furnished with a wooden console table decorated with a case of flowers and large mirror framed with solid carved wood. It also has one accent chair and a yellow bench place underneath the staircase. This foyer design combines modern and classic elements, using natural stone floors combined with modern cool gray walls. It has a large curved staircase with dark wood steps and railing which matches the pedestal table in the middle of the round space. For foyer furniture you will see 2 upholstered benches which follows the shape of the curved wall and matches the round table decorated with a houseplant.. 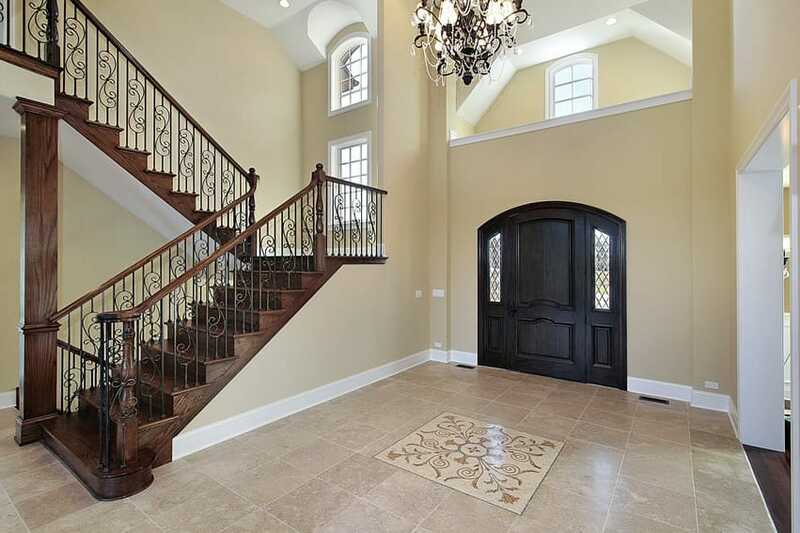 This entry way is sure to make a huge impression with its grand curved double staircase foyer and the star design on the floors which matches the color of the carpet running along the steps of the stairs. Walls are painted in a light cream-orange shade and pine wood was used for the stairs, making the space look bright. Just under the stairs you will also see the archway leading to the living area. A beautiful chandelier is certainly a centerpiece of this room and look spectacular suspended above the double staircase. This simple foyer is smaller than the previous examples and decorated sparsely furnished with 2 upholstered side chairs and one side table decorated with a potted orchid. The stairs is simple yet elegant with Mahogany planks for its steps and matching handrails, as well as wrought iron railing with elegant sinuous design. Unlike the previous examples, the stairs in this foyer does not face the entrance door, but instead faces in the direction the door opens. And instead of a grand staircase, this space uses a more practical U-shaped stairs. Upon entering, what you will notice is the bright-looking foyer space with white ceramic tile flooring and walls with very light yellow paint, and in the middle, you will see a large pedestal table with white-painted pedestal base and a clear glass top. This foyer is very much reminiscent of an English country home with its dark oak wooden floors and matching solid wood L-shape staircases which leads to the upper and the basement floors. A large traditional area rug lays across the floor, and on the wall opposite the stairs, there are 2 side chairs and a console table with a lamp and a golden-framed mirror. The iron lamps, the wood-framed windows and the exposed wooden trusses contribute to the country look of the space. Having foyer furniture such as these elegant chairs allows a place for quests to wait in comfort. 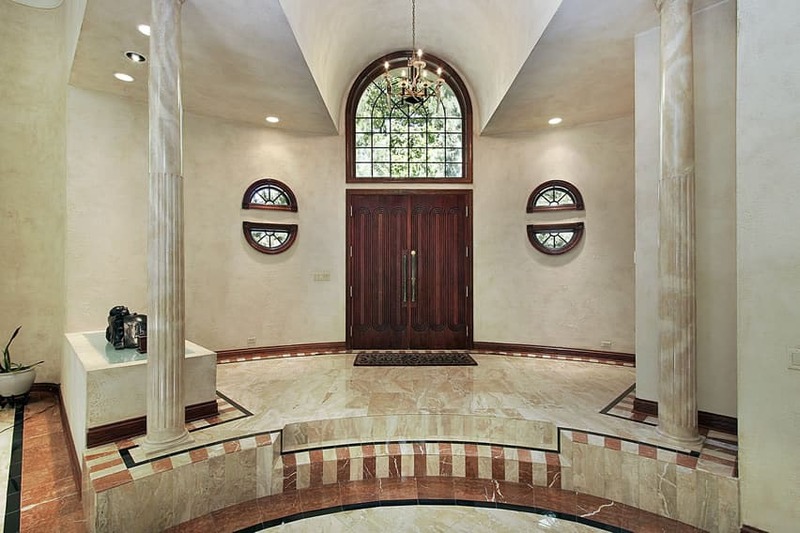 The most unique part of this foyer design would be its large columns and archways and a high ceiling with a large wrought iron chandelier, giving the space a grand and dominating appearance. 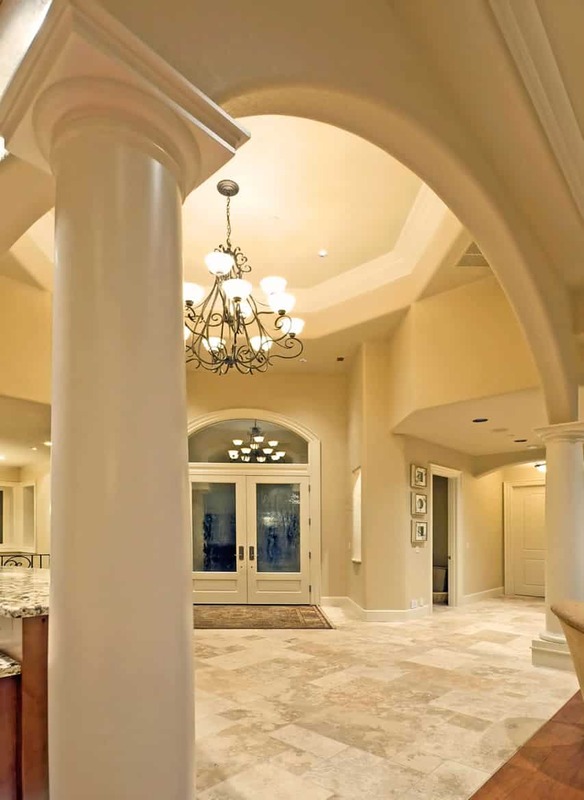 Floors are of natural stone tiles, and therefore is not uniform in color, while its walls are painted in an oatmeal color to match the warm tones of the stone floors. Foyer design ideas can be used to achieve a transitional style by combining traditional design with modern elements. Walls are painted in an oatmeal-beige color with white-painted moldings making it look perfect with the beige sandstone flooring. Upon entering, a large square area rug awaits you, a small console table on your right with a matching round mirror, and a staircase right before you clad in golden maple wood with wrought iron railing design. 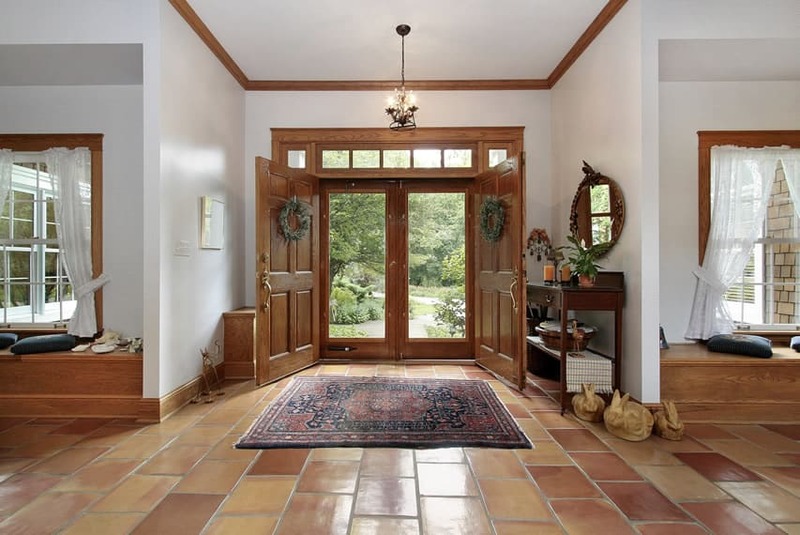 Beyond the large double pine wood door is an open foyer with terracotta ceramic tile flooring and plain white walls which seems to balance the wood tones of the wood, moldings and window frames. One side perpendicular to the entrance door has a console table with various decorative items and a mirror, while on the other side, there is a low shoe shelf. Upon entering the large solid wood doors you will be welcomed by a large wooden staircase with a roll of white carpet leading you upstairs. The flooring of the foyer area is an elegant combination of different ceramic tiles forming a pattern out of whites, reds and black tiles. Walls are simple and white with Oak moldings matching the finish of the stairs, creating a cohesive look throughout the house. The simple elegance exuded by the combination of white moldings and gray walls of the space blends well with the dark mahogany floors and stairs used in this foyer design. The space is illuminated with simple modern chandelier, while it is furnished simply with a chaise lounge, an accent chair and one small pedestal table. For this foyer design, the pattern on the wooden flooring is very much unique, combining 3 different tones of wood to create a medallion pattern in the center of the foyer. As you enter the white wooden door, it is one of the first things you will notice apart from the console table and antique mirror decorated with large plants. The stairs run parallel to the door with a carpet running along the length of the stairs, while a large chandeliers hangs above the second floor ceiling. This space has a rough and heavy appeal mainly attributed to its use of stone materials on both its walls and floors. Walls are either of masonry stone finish or brick finish, and the floors are also of natural-cut stone in 3 different tones. The solid mahogany wood furnishings help balance out the roughness of the floor and wall finishes making it look more homey. A fairly small foyer with Golden oak floors to match the wood used on the stair’s steps. The walls of the space have white=painted moldings on the lower part and the rest is finishes with green wallpaper with wide vertical stripes, helping accentuate the height of the room. It is simply decorated with a large chest of drawers with a few blue and white ceramic chine hung on the walls and a few decorative items on top of the drawers. 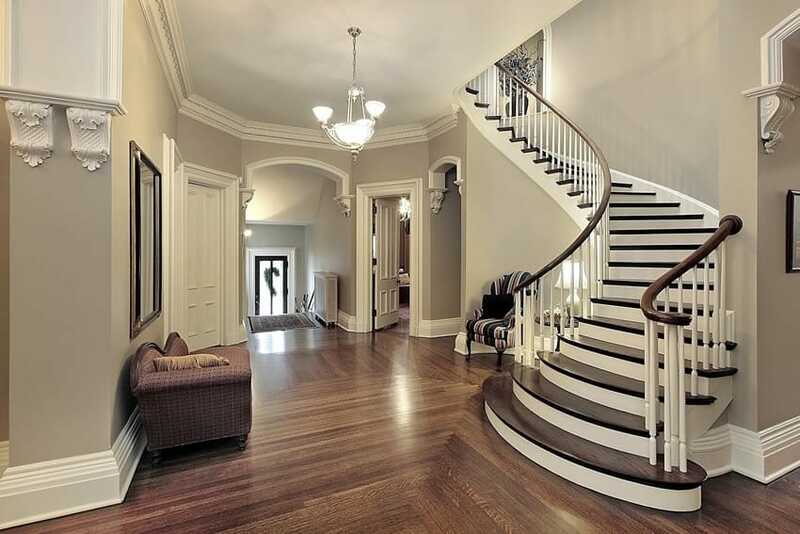 This simple foyer does not have any fancy decorations, furnishings or accessories. It simply relies on its simple but elegant finishes. On the floor you will see a large pattern tile on the center of the smaller ceramic tiles serving as the accent piece of the foyer. It has a large U-shape stairs made with dark mahogany and wrought iron railings, while the walls are simply painted in a light yellow color, helping make the space look bright. 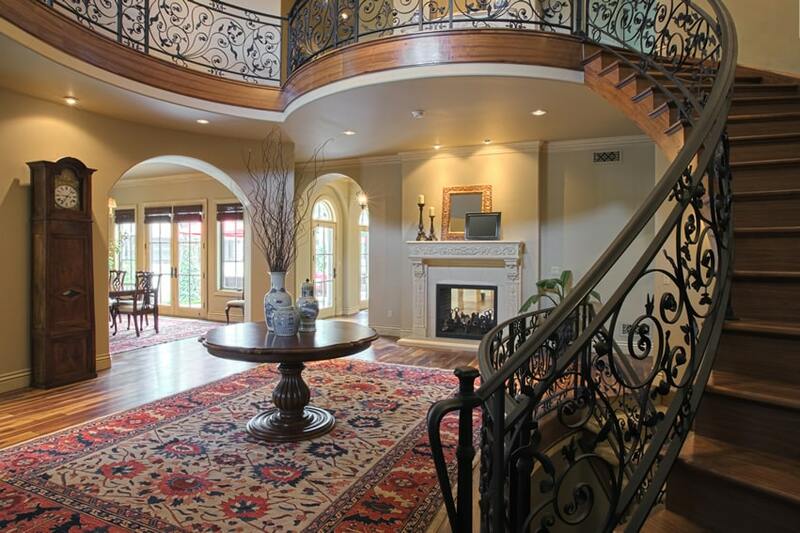 This grand foyer has a mixture of influences from different design styles. You will see the neo-classic influence on its columns and moldings, art deco on its geometric stairs and some Asian elements evident on its accessories. As you enter you are welcomed by a large European-style rug which leads you to the staircase framed by two well-manicured bonsai plants. On the stair’s landing are vintage suitcases piled on top of each other to serve as a console table and above it hangs a folding oriental artwork. 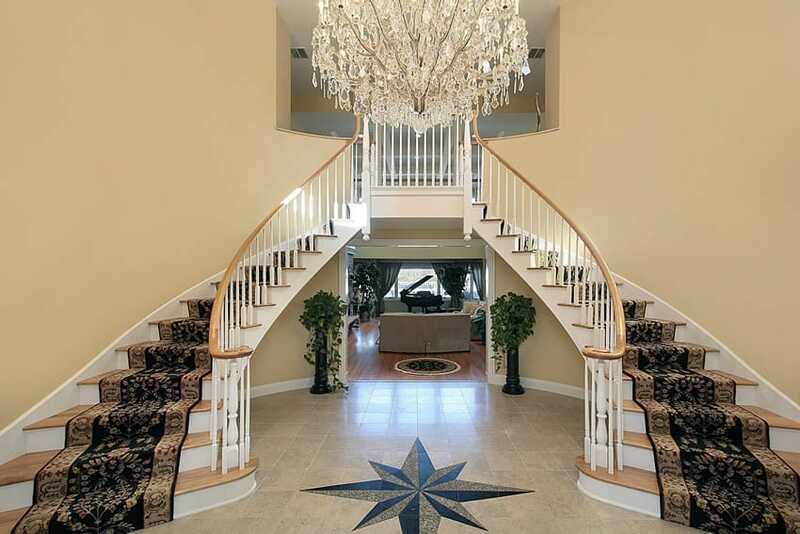 To complete the elegant look of the space, a large crystal chandelier looms above the staircase. 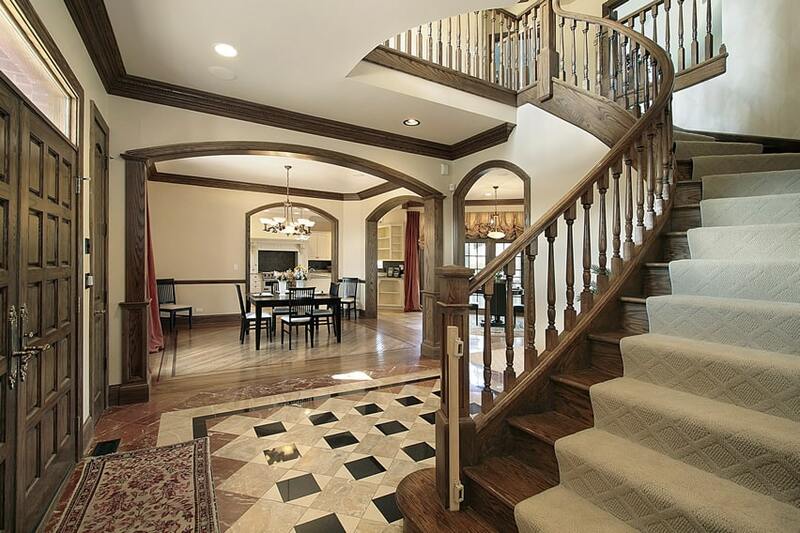 An interesting design element is how the single stairway splits in to a double staircase to create a grand impression. Dark mahogany entrance door with clear glass openings places itself underneath the elegantly curved staircase. The light yellow marble tiles of the floors matches the warm gray paint of the walls adding a gentle warm glow to the space. This foyer is unique as it is elevated from the rest of the space, clearly demarcating the space of the foyer. Two steps down the foyer and you are lead into the main floor “level”. The foyer is basically unfurnished, with two columns framing it. The floors are of porcelain tiles framed with black and a red and cream checkered border tiles. The frosted glass entrance door allows natural light to leak into the space without sacrificing privacy. Upon entering you are greeted by the dark oak floors and the traditional area rug that covers almost the entire floor space of the foyer. The only furnishings in this area is a small console table with a flower vase set against the stair railing going down to the basement floor. Upon entering this home you are welcomed by a visual shock that is from the detailed floral pattern of the walls running from the first to the second floor walls. Double wooden grand staircases curve elegantly meeting at the second floor, forming a gentle arch that is accentuated by the large chandelier hanging from the ceiling. On the ground, small accent chairs are leaned against the sides of the two stairs, along with two side tables, a deer sculpture and a plant on a ceramic vase. 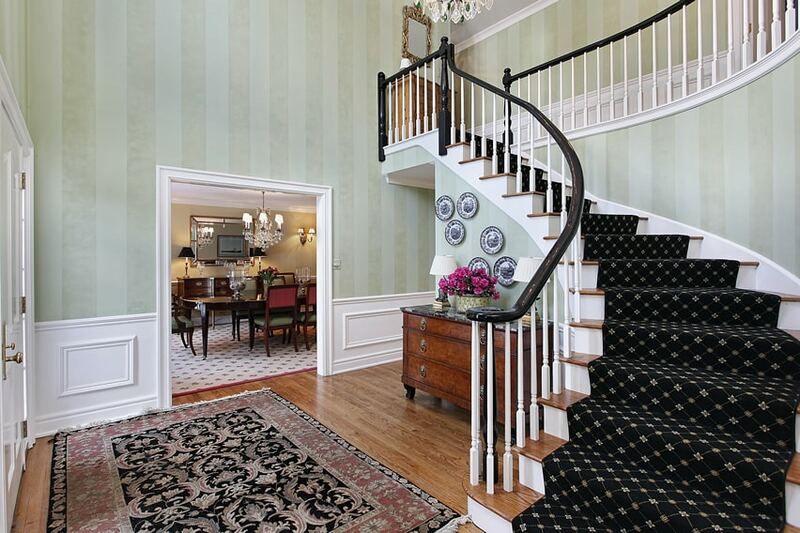 This small foyer allows you a view into the dining/library through the opening in the hallway. 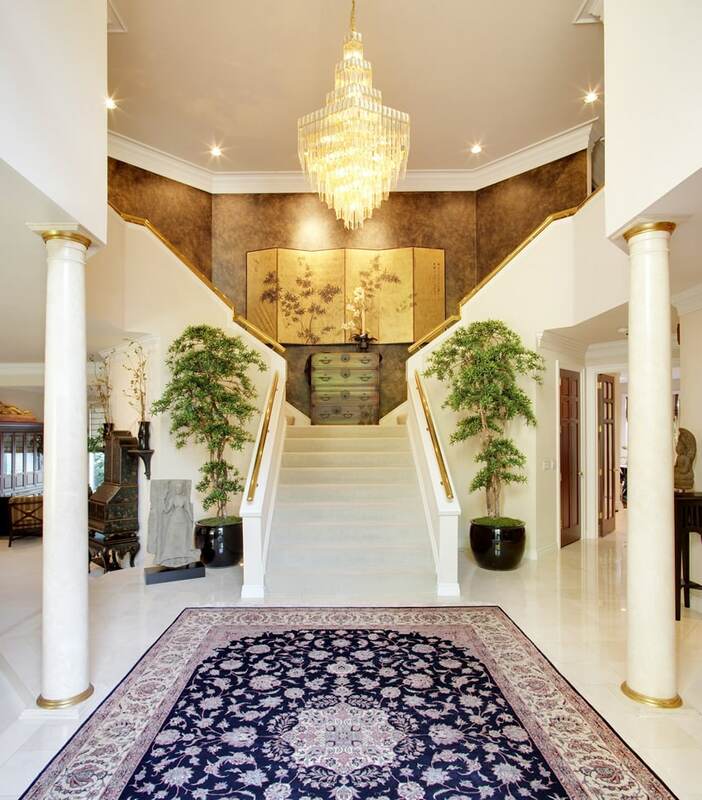 The foyer itself is sparsely decorated with a traditional area rug, a small elephant sculpture placed on the floor and a white cabinet place against the side of the stairs. The stairs is of a simple design, with dark walnut steps and matching handrails, and turned wood painted in white for the railings. Columns painted in white can also be seen from the hallway, while the walls along the stairs have molding details and has an interesting combination of slate gray paint and wallpaper. Entry to this home is welcomed by a large staircase made from red mahogany wood with matching wooden handrails and wrought iron railings. Walls are painted in a light yellow color with white wooden moldings and openings are decorated with faux columns. On the wall opposite the staircase is a console table made from iron framing and clear tempered glass top, with 2 table lamps and a brass-framed mirror to complete the set-up. 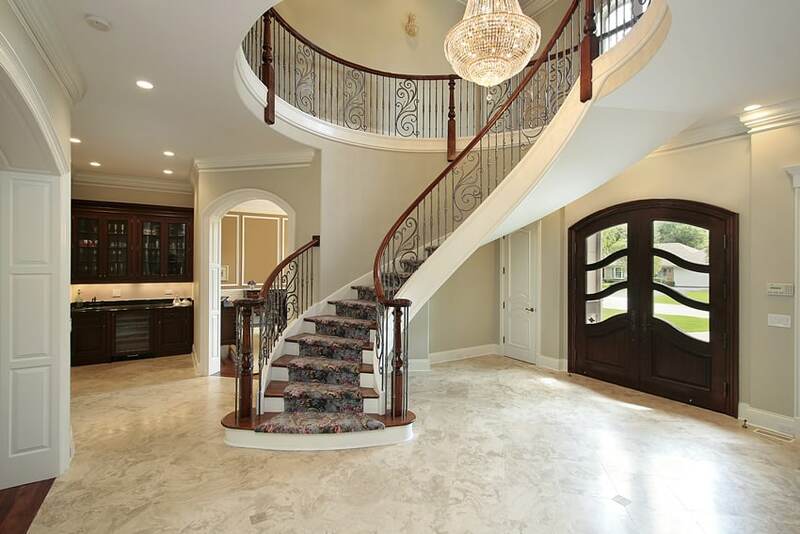 Travertine marble flooring gives the space an elegant feel. Following a modern theme, the white entrance door almost conceals itself from the white walls of the interiors if not for its door hinges and handles. Upon opening you will be received by a rectangular area rug with patterns and colors that matches the overall color scheme of the space. Floor tiles are light beige in color and opposite the door is a curved and organic-shaped staircase with steel blue carpeting for the whole steps. While the sides of the stairs are poured concrete, it has a wooden railing following the elegant curve of the stairs. This foyer welcomes you with a large round and wooden pedestal table smacked right at the center of the large traditional rug. This is decorated with blue 7 white vases, making it the center of attention as you enter. Beyond the table is a small fireplace with classical detailing and decorated with frames and candles on top. You will also notice the elegant design of the wrought iron railings and handrails of the staircase of this home and the large grandfather’s clock opposite the stairs. When thinking of foyer design ideas its important to incorporate furniture that is warm an inviting and shares a bit of your own personal style.